It’s too hot at 2020 Hindsight. It’s too hot at The Creative Journey. It’s too hot at An Inch At A Time. It’s too hot at UnHip LA. It’s too hot at Gem City Images. It’s too hot at Our Obligatory Blog. It’s too hot at Stonehill News. When did you get a Prius? We’ve had one for a while now. It’s not the car we stick bumper stickers on. Let me know if you want some hypermiling tips. I just finished a tank at 60.8 MPG. I’ve tried to turn off my wall AC here at my apartment to conserve energy, but after a half hour I’m sweating like crazy. Glad I stayed inside all day, though. Tomorrow I might find an air-conditioned cafe to kick it at during high noon. Here’s a way I’m keeping a bit cooler, a combination of A/C and swamp cooling. I have the AC on, yes, but set to a higher temp 79, 80… and I wear an old big shirt (tee shirt material) that I wet with water. And wear it. Greatly increases the comfort level while the shirt’s wetness evaporates. thx for the link. susan, that is a great idea with the shirt. i also heard that there is something called an ice vest that people wear. I think I’ll just make some room in my fridge and crawl into it. At least the cold beer will be easily accessible. My pool’s 101 degrees. Don’t need to heat up the hot tub! The wikihow has great tips on how to stay cool…. Nice plot of temperatures at JPL, showing six days in a row of 105 and higher maxima, and today’s lovely “cool” 96.
on September 4, 2007 at 3:24 pm | Reply obfuscated.org » Corey Porter's Weblog » Blog Archive » I’m glad last week is over. 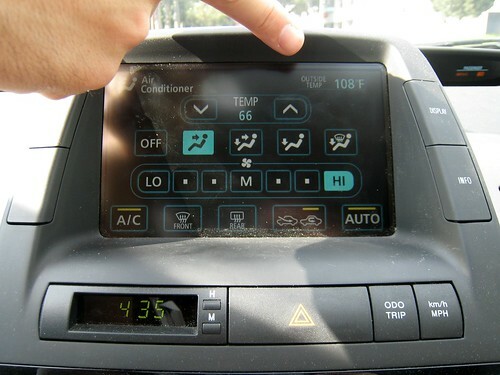 Do you really set your A/C in the Prius at 66 degrees? Is that energy efficient? I set mine at 76 and find that’s plenty cool. At any rate, with the high cost of running the A/C at home, it’s cheaper to drive around in the air conditioned Prius.